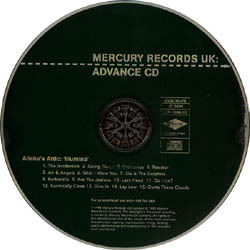 Promo interview disc in slimline jewel case. Karen and Shellie answer 16 questions about themselves and the making of the album. 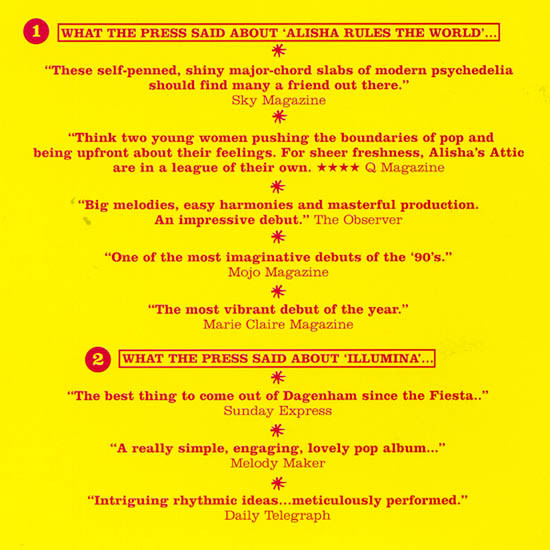 The questions are listed on the inner sleeve, and the answers are given on the disc. This style of promo is used by radio DJs who "ask" the questions then Karen and Shellie "answer" them, giving the illusion of a live radio interview. Full length promo CD with the same 13 tracks as the UK release. Back inlay has a mini-biography, and the only sleeve difference from the commercial release is that the cover shot is slightly zoomed in. 6 track promo sampler in card sleeve. 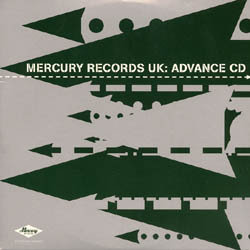 Full 15 track advance CD in generic Mercury card sleeve. 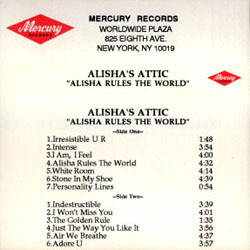 Mercury circulated an awful lot of promo copies of this album; this is only one of at least four. 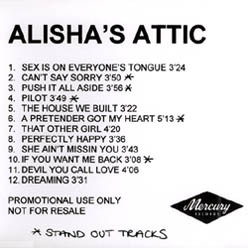 Full tracklisting same as item below. Promo sampler in full colour outer and inner sleeve. 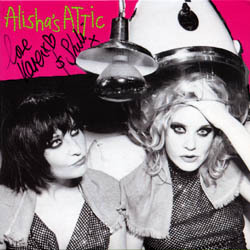 This CD was later withdrawn as the girls decided the tracks needed remastering. Many of these made it into circulation before this, so there's a lot of them around. Promo sampler in full colour outer and inner sleeve. 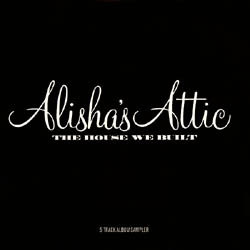 Different sleeve from the version shown above - so in the end both versions were withdrawn, but this one is extremely rare. Click on the sleeve for a full size version. 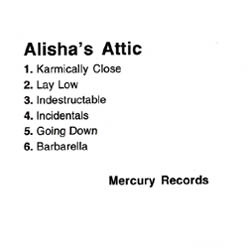 This card inlay was included in the withdrawn sampler. Click on the small version to read in full. The inner sleeve and disc was the same as the other version, and only one slight difference on the back cover (it's matted green instead of the natural background). 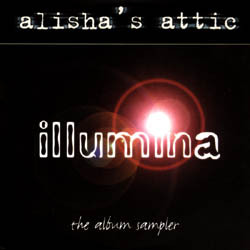 This version of the first sampler didn't surface until 2004, which is a long time since the album came out in 2001! The girls' Mum was hoarding copies which she only released this year. No difference in the songs, just the sleeve. 5 track album sampler of the final remastered versions, in plain black card sleeve. 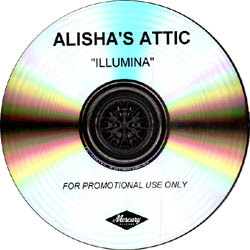 Promo CD-R in jewel box. The CD-Ris plain, not printed, hence no disc scan. 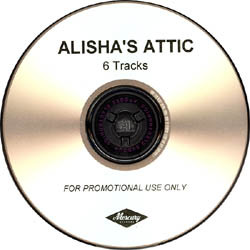 Six track acoustic CD in the "unplugged" style. 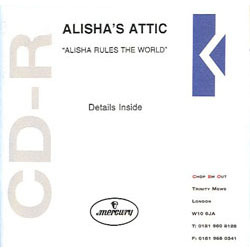 Comes in slimline jewel case with card inlay. Want to listen to this? 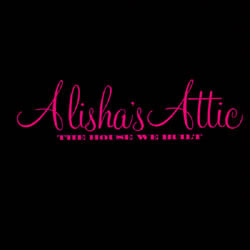 Go to the Attic Jukebox page! 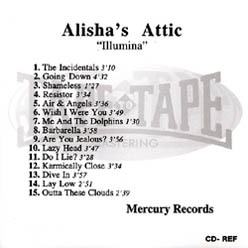 Full 12 track promo CD-R that apparently also escaped from the Mercury vaults before the remastering. There are very subtle differences in the sound of some of the tracks on this promo to the cuts on the final release. One amusing fact, at the end of "Push It All Aside", after the laugh Karen is very clearly heard to say "oh, ****ed up!". Of course that was edited out for the commercial release! 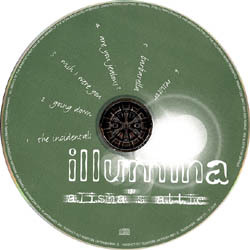 This CD was out a good 9 months before the eventual release. Slimline jewel case with insert. 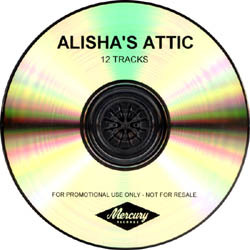 Second full length 12 track promo CD-R, featuring the "remastered" versions. Note the difference in track timings from the previous unmastered CD-R. These versions are all shorter and some of the instrumental bits sound quite different from the previous one. These are the versions that turned up on the eventual commercial release. This CD-R comes in an album style jewel box. 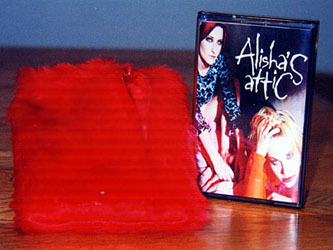 4 track album sampler cassette in a funky fuzzy red miniature "pencil case" style zip up pouch. 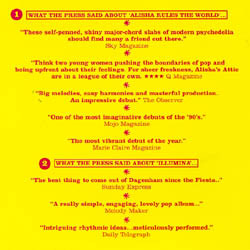 Mini biography featured on the inner sleeve. A really cute promo, one of the nicest I've seen. 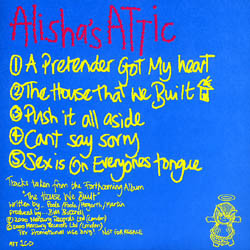 Full length promo cassette, same tracklisting as the eventual commercial release. 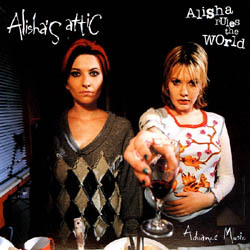 Alisha Rules The World is the only Aa album to receive a Stateside release. 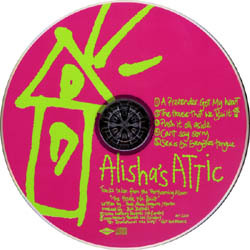 A full length promo CD and a 1-track "I Am I Feel" CD single promo were also released in the US. 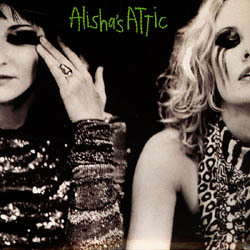 Despite their Lilith Fair tour, these are the only US promos I'm aware of. 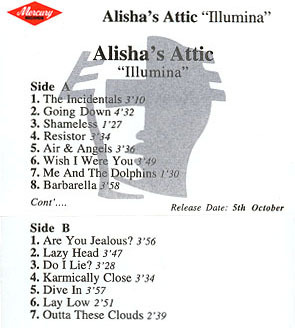 Full 15 track promo cassette, same tracklisting as given above for the CD-R. 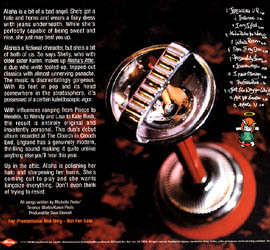 It's surprising that this item exists at all, given that CD-Rs were starting to replace cassettes at this time, and Mercury already issued 2 CD-Rs for this album. Just about the only good use I found for promo cassettes at the time was that you could play them in the car!